PRESENTING ... The first students enrolled in the Academy of Construction & Design at IDEA. Dimitri Cheuko dreams of becoming a professional soccer player. But first he’s attending college to study accounting so he can help others in his home country of Cameroon. Stephanie Parker aspires to be an entrepreneur, pursuing studies in mortuary science before opening her own funeral home. And Steve Cheuko looks forward to one day becoming a computer scientist and expanding technology to his native country in Africa. These are the dreams of young men and women honored at the 2016 Meet the Future Luncheon on May 13 at The Hamilton in Washington, D.C. Hosted by the D.C. Students Construction Trades Foundation, this year’s ceremony marked two milestones: 10 years celebrating the bright futures of Academy of Construction & Design (ACAD) students and the skilled training facility’s first year at IDEA Public Charter School in Northeast Washington, D.C. The highlight of each Meet the Future luncheon is the awards ceremony, where graduating seniors are honored for their academic excellence, personal character and achievements. While this year continued that celebratory spirit, there was a key difference: a focus on the freshman class – the Academy graduates of 2019 – since this is the program’s first year in its new home. After an introduction to the fundamentals of building and construction in the ninth grade, students are immersed in a two-and-a-half- year program specializing in a technical pathway of their choice. “To ensure we build our future with a strong class of students, from freshman to senior year, students from grades nine through 12 are eligible for awards this year to recognize their achievements as Academy students,” said Beth Moore, program director for the D.C. Students Construction Trades Foundation, before the presentation of awards. With the move to IDEA came a unique opportunity to expand the home building program to benefit both IDEA students and the surrounding community, noted moderator Carol Randolph, chief operating officer of the D.C. Students Construction Trades Foundation. “We continue to inspire and help students build bright futures through skilled trades education and training. We’re also confident the Academy will continue to grow in the learning environment of IDEA that emphasizes leadership, vocational and technical learning, community service and excellence,” continued Randolph, also a co-founder of the Academy of Construction & Design. 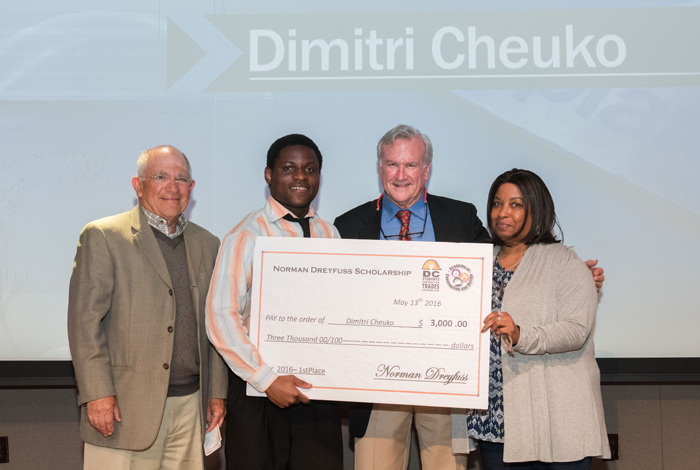 This year’s first-place winner of the Norman Dreyfuss Scholarship award – accompanied by a $3,000 scholarship – is Dimitri Cheuko, whose next step after graduation is to attend the University of the District of Columbia and study business management, with an emphasis on accounting. ON THE MARK Senior Dimitri Cheuko (second, from left) shut out his competition, taking top honors for the Norman Dreyfuss Scholarship awards presented by (clockwise) IDI’s Norman Dreyfuss, Miller & Long’s John McMahon and Bright Futures Bootcamp’s Emille Robinson. Dimitri, 20, said his long-term goal is to strengthen the foreign trade relationship between the United States and his native country, Cameroon, and build its domestic trade infrastructure. To make the economic and job employability situation better there, he hopes to do work that can influence fiscal policy, lead to the building of more banks, and improve the country’s gross domestic product. That would be important, he said, for improving the socioeconomic status of family living there as well. In the near future, however, the graduating senior said, “This $3,000 scholarship will enable me to go to school and also to save some funds.” The money would also be a jumpstart to reaching his other personal goal – playing professional soccer. 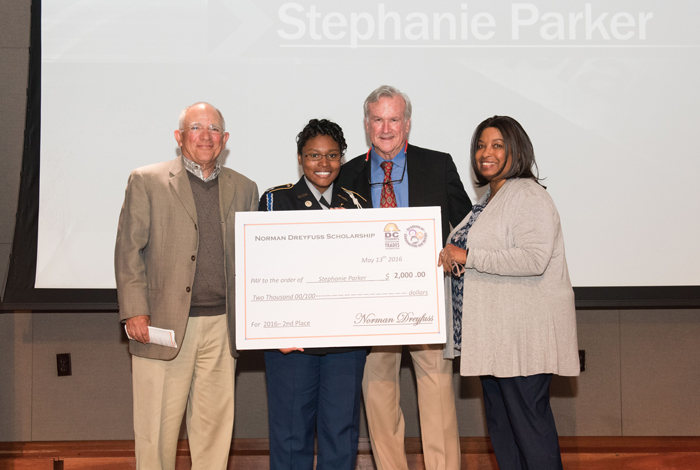 Meanwhile, 19-year-old runner-up Stephanie Parker received a $2,000 Norman Dreyfuss Scholarship. After accepting the award, she told JOBS Coalition Pathways that the scholarship will help pay for classes and books as she pursues studies in mortuary science at Piedmont Technical College – Saluda County Campus in South Carolina. “I believe [the Academy] pushed me to where I got today,” Parker said with a big smile, and dressed in her JROTC uniform. ENTREPRENEURIAL SPIRIT Stephanie Parker, Norman Dreyfuss award runner up, plans to study mortuary science in college and open her own business one day. 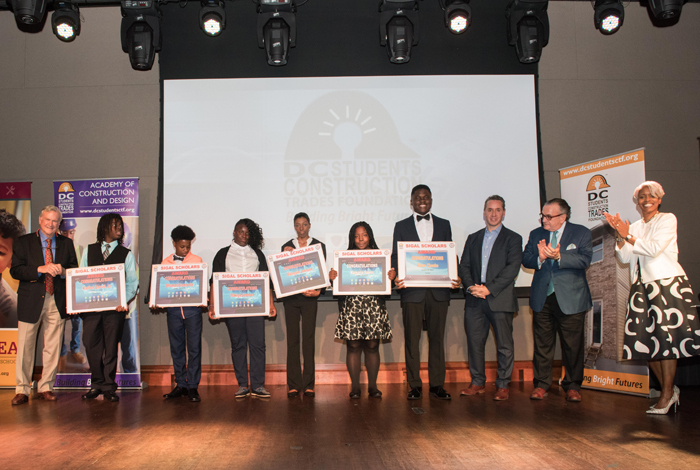 The awards are named after Norman Dreyfuss, COO and executive vice president of IDI Group Companies, and a D.C. Students Construction Trades Foundation Executive Council member. Endowed in 2008, the scholarship fund aims to help “bridge the divide between high school graduation, and college and career.” Since 2009, the Dreyfuss Scholarship fund has awarded almost $50,000 to 18 Academy graduates. The Sigal Scholars Awards, endowed through the Sigal Family Foundation in 2013, honor outstanding Academy students in the ninth, 10th and 11th grades who will be returning to start their specialized skilled trades training during the 2016-2017 academic school year. These student award recipients were honored for exhibiting “character, quiet competence, good citizenship, a competitive spirit, and a drive to meet every challenge,” said Moore. Six students snagged the honors, with five being gifted tablets. TAKE A BOW (From left) Miller & Long Chairman John McMahon applauds the 2016 Sigal Scholars (center) with GCS President Michael Sigal, SIGAL Founder and CEO Gerry Sigal, and ACAD Director Shelly Karriem. 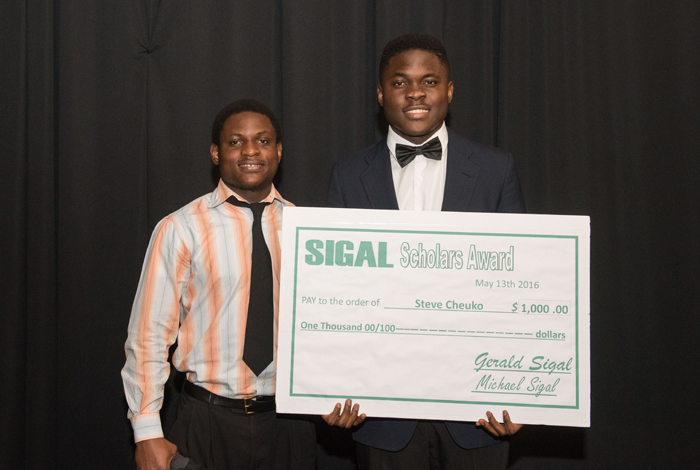 Steve Cheuko, Class of 2017, rounded out the list of 2016 Sigal Scholars and received special recognition for being a “multi-talented honor roll student who consistently demonstrated leadership.” The judges were so impressed by his dedication, they awarded him a laptop computer and $1,000 cash prize. “In life you never know. Sometimes you fail, sometimes you succeed. But this time I kinda knew with my hard work and I prayed to the Lord every day, that my hard work would payoff,” said Steve, 18, after the ceremony. Steve, whose career goal is to become a computer scientist, said he’ll be able to work on college applications at home with his new laptop. “I’ll have to work on a lot of essays next year for scholarships, so it will help me [reach] my goal,” he explained. He hasn’t yet decided how to use the money prize. DOUBLE KUDOS Steve Cheuko (right), with brother Dimitri, receives special honors for academics and leadership as a 2016 Sigal Scholar. The day brought a double win for the Cheuko brothers, Steve and Dimitri. Steve said he supported and encouraged his older brother throughout the writing of his essay, part of the criteria for winning a Norman Dreyfuss and other scholarships. Students attended a series of Saturday writing bootcamps to fine-tune essays before submitting them to the judging committee. “I’m proud of him and I’m happy for him,” said Steve, whose college list includes Penn State, Howard University, University of Maryland, Virginia Tech and Georgetown. The Marshall Janifer Outstanding Student Award is designated for an Academy student with the “highest GPA, lowest absences and highest participation in ACAD programs.” It honors the memory of Marshall Janifer, mentor, coach and longtime carpentry instructor at the Academy of Construction & Design. This year’s recipient – ninth grader Kyeon Ford – was lauded for being “motivated, an excellent and reliable student who is helpful and kind, and a positive influence to his peers.” Ford wasn’t present to accept the award, but will receive a tablet computer as recognition. More than 175 sponsors, family members and other supporters turned out for the latest luncheon to cheer on the students as they took to the stage to accept their awards. Just an hour earlier, the students put their networking skills front and center on a smaller stage during a reception ahead of the event. There, students handed out business cards and handshakes, and talked of their future plans with industry leaders across construction, electrical, architecture and other specialty trade areas. 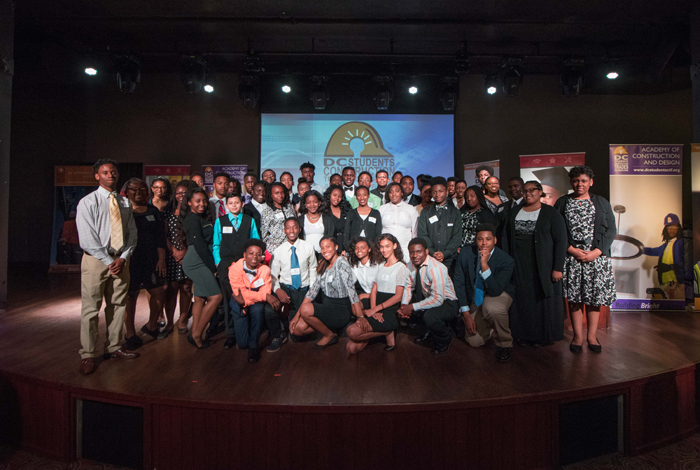 “We have to keep a new generation of skilled [young] people coming through our ranks,” said John McMahon, president of the D.C. Students Construction Trades Foundation and chairman of Miller & Long Concrete Construction. And it’s also important for current Academy students to see alumni giving back. McMahon credits this program for helping young people who possibly didn’t have a good shot at succeeding in the world. “We’ve seen [students] blossom, come back and honor what we do here,” he said.